Been diving in Hin Pee Wee? Please Vote! This dive site is not named after a TV personality but after a Thai man who has been a long-term resident of Koh Tao; Mr. Pi Wee. 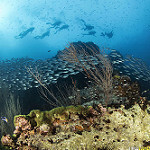 It is one of the deepest dive sites in Koh Tao and is 200 meters from white rock. 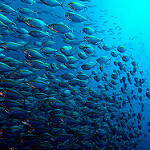 It is often considered to be one of the best dive in Koh Tao. As it is a deep dive, it is recommended that it be only completed by experienced divers. The main part of the dive site starts at a pinnacle, which is at about 7 meters. This then drops down to about 24 meters. There are also two smaller pinnacles as part of the dive site and also some other rock formations all waiting for divers to explore. As this dive site is mainly for experienced divers, it is not as popular as other sites and so is mostly empty and peaceful. The coral is mainly made up of hard coral, which is in good condition. Divers will be treated to spotting porcupine fish, massive puffer fish, and yellow tail barracuda. Green turtles are very commonly found here and it is also common to see blue spotted rays and white eyed moray eels. The dive site is sometimes used for advanced training and also makes a great spot for underwater photography as seahorses, Jenkins whip rays, blue spotted stingrays, and white eyed moray eels are all great subjects for brilliant underwater photos. Map of Koh Tao, Hin Pee Wee dive site.